Monday: Clouds thicken, evening rain and mix arrives. Highs around 40. New Year's Eve: Rainy and breezy. Temperatures hold around 40. New Year's Day: Clearing and very windy. Highs near 50. West wind gusts to 50 mph. The irony of our incoming storm lay in the timing – after a splendid New Year’s Eve Day, rain, snow and mixed precipitation arrives just as revelers are taking to the First Night festivities, creating slick roadways and reduced visibility. A gorgeous sunrise brought a pink and orange dawn over a cool airmass in New England, but the approaching storm moving northeast out of the Ohio Valley will carry warmth with it. It will promise a mostly rainy event for Southern New England. 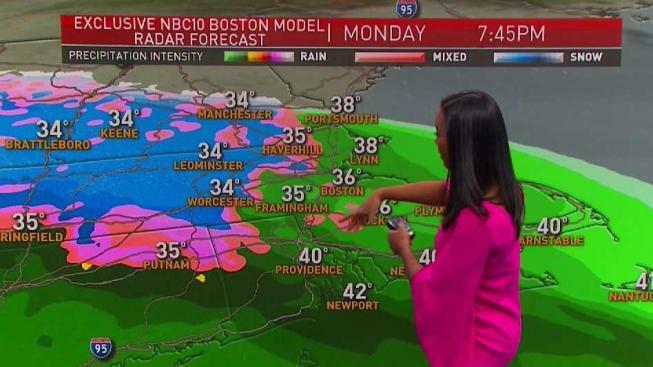 Nonetheless, enough cold air lingers in Central and Northern New England for at least a start as a wintry mix of snow and sleet. 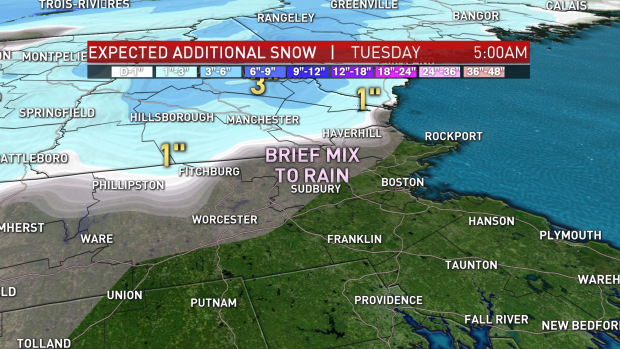 This mix will reach as far south as the hilly terrain of Northern Connecticut and western to Central Massachusetts. It will also certainly reach from Southern Vermont and Central New Hampshire northward, where plows will come out New Year’s Eve to predawn New Year’s Day as snow accumulates. For Boston’s First Night celebrations, a chilly rain will be falling with temperatures around 40 degrees and an increasing breeze from the southeast, bumping temperatures into the 40s overnight for most of Southern New England. This will be changing snow to mix even in the North Country by dawn Tuesday. On Tuesday morning, leftover rain showers depart early, but the wind will increase from the west, gusting to 50 mph at times the first half of New Year’s Day and causing isolated power outages before quieting slowly during the afternoon and evening. By Wednesday, colder air will be in place with highs only in the lower 30s ahead of our next likely storm centered on Friday. It will likely bring a rain and snow line into play again before departing no later than midday Saturday for improving weekend weather. Our exclusive 10-day forecast shows cool air building stronger early next week. Expected additional snow for 5 a.m., Tuesday, Jan. 1, 2019.